Led by the Ninth Khamtrul Rinpoche Gyalwa Dokhampa Shedrub Nyima, a major Dharma event came to a close on 26 March in Taipei, after 10 days of elaborate offerings to the wrathful deity (dharmapala) Mahakala, protector of the Dharma. It marked the first time that a complete and unabridged Mahakala Puja has been conducted in Taiwan. The occasion included preliminary practices, sand mandala creation, and site consecration, followed by eight days of primary practices, including recitations, visualizations, and sacred cham dance, performed by the monks and lamas of Khampagar Monastery in India. Khamtrul Rinpoche and the monks belong to a lineage of realized yogis originating in Tibet and now residing at Tashi Jong, in the northern Indian state of Himachal Pradesh, where they have preserved their unique and precious traditions of authentic yogic practices. Lama Dorje, a Taiwanese monk from Khampagar Monastery and the organizer of the event, went to Tashi Jong at the age of 14, living and practicing there for some 17 years, before returning to Taiwan at 32. He gave extensive and detailed explanations and instructions in Mandarin during the event to the public and participants. The Khampagar community of practitioners, who settled in Himachal Pradesh after the Chinese occupation of Tibet, was nearly in full attendance at Taishan Stadium for the traditional tantric ceremony, which was held simultaneously as a spiritual practice for liberation while also being open to the public as a cultural performance. The puja featured Black Hat dances, chanting, and rich offerings of wine, fruits and tormas, which continued daily from early morning to evening, with only short breaks. The event culminated on Sunday evening with a grand ritual fire, during which the delicately crafted tormas and a large namkha canopy was solemnly carried from the shrine in center of the hall onto a pyre in the courtyard outside, as a symbolic ridding of evils, obscurations, and misfortunes. The puja was formally concluded with the dissolution of the sand mandala, some of which was used to bless each participant on the forehead. Khamtrul Rinpoche personally blessed all participants individually and distributed colored protective cords. Seated beside Khamtrul Rinpoche for the puja was Togden Acho, the senior-most initiate and last surviving member among those who left or escaped from Tibet with the Eighth Khamtrul Rinpoche Dongyü Nyima. ** Togden Acho travels with Khamtrul Rinpoche when he gives teachings worldwide. A repeat of the March puja planned in two years’ time. Although the puja was held in a civic building, Tibetan sacred dances are considered special occurrences that can transform ordinary places into sublime and sacred spaces, and the dancers themselves become part of a moving mandala. Attired in fine traditional robes and sacred masks, and bearing ritual implements, the dancers orbit and spin in circles (do-ra) like cosmic bodies, alternating graceful and forceful steps—at times appearing almost weightless and at times stamping as if to shake and shatter the ground. 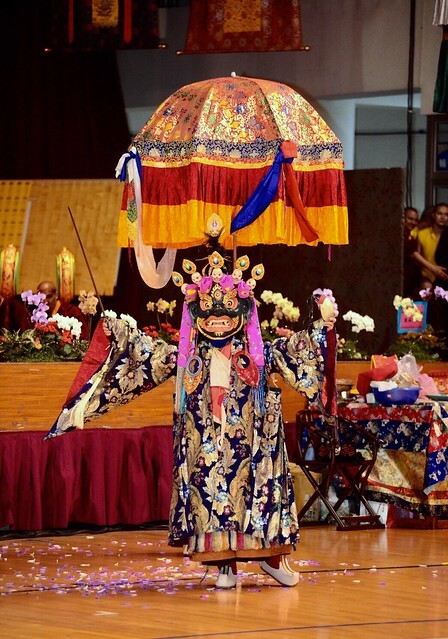 The monk performers represent deities and protectors acting on the Earthly plane. The dances are said to emanate energies with the intent to purify, invoke, and praise the Dharma protectors and deities, to help subjugate and expel perceived hostile forces and generate blessing. Khamtrul Rinpoche, born in 1980 in Bomdila, Arunachal Pradesh, is the head of the original Khampagar Monastery in the traditional Tibetan region of Kham, and oversees more than 200 monasteries and nunneries in eastern Tibet from his present seat in Tashi Jong. * Khampagar is the main monastery of the Khamtrul Rinpoche lineage; the original monastery in Tibet has been rebuilt and Tashi Jong is where Rinpoche currently resides. ** The Eighth Khamtrul Rinpoche did not escape from Tibet, rather he was advised by the protectors to leave Tibet in 1957 on a pilgrimage to India, which lasted around two years.